Thomas: Weight is an important feature to consider when it comes to running shoes. The Reebok Floatride Run Fast weighs a featherlight 7.25 oz. / 206 grams for a size 10.5! If you don’t keep track of weight, that is a fantastic number for a shoe with this much cushion underfoot. Reebok didn’t get the Floatride Run Fast down to these numbers by accident. Upon inspecting the shoe, you can see all the deliberate details the designers sweated over to get the shoe as light as possible. The upper is constructed from a breathable one-piece Ultraknit engineered mesh with the thinnest welded overlays that support the lateral and medial fit. The laces are skinny, and the attached tongue’s only padding is a patch of foam where the top laces come together. 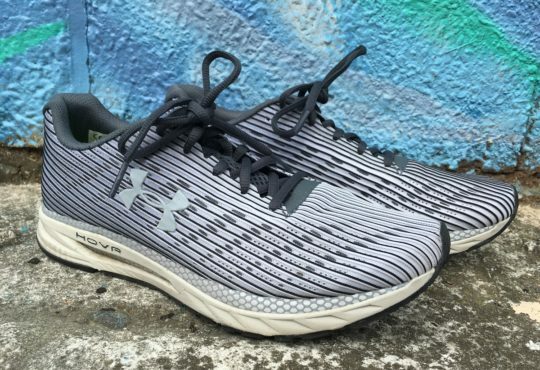 The rigid heel counter and collar have foam padding for comfort and heel lockdown, but even there the designers punched holes in the foam to keep the Floatride Run Fast light and nimble. The Reebok logo is printed on the shoe instead of adding more material. I had no irritation or hot spots from the upper. The Midsole and outsole are where the magic happens for the Floatride Run Fast. 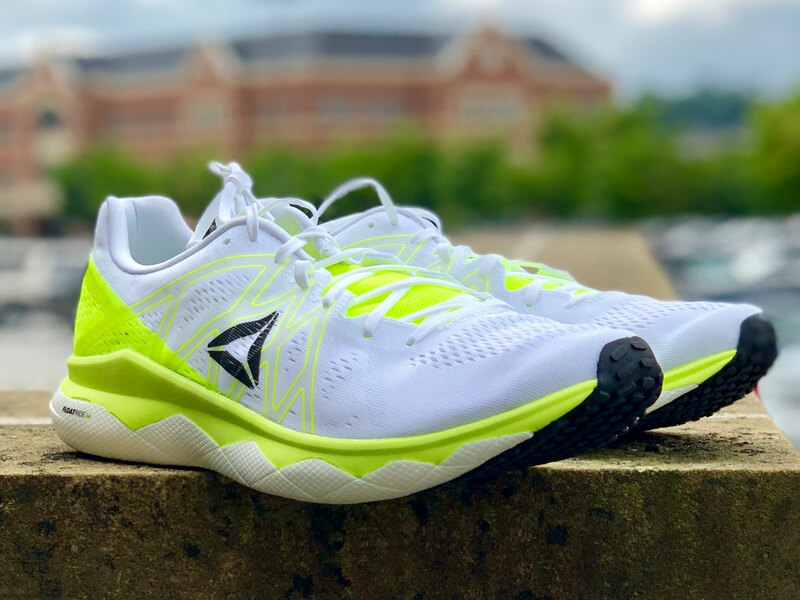 The Midsole is made up of two parts, a stabilizing more rigid EVA rim that provides the aforementioned stable platform and acts like a plate giving Floatride Run Fast pop and springiness. 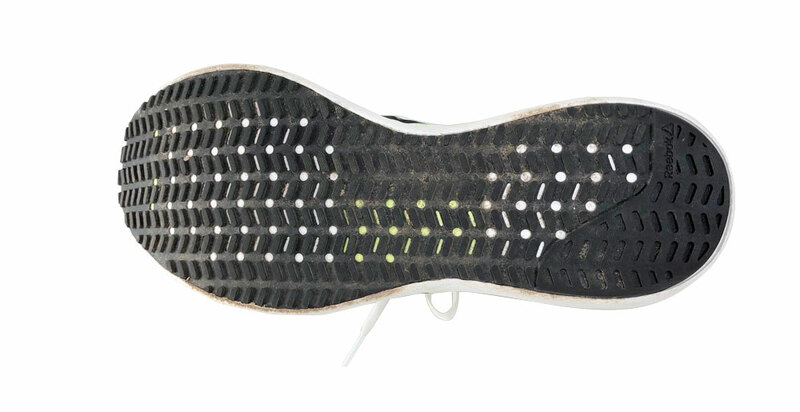 The second layer of foam is pebax, the same type of foam used in the Nike Vaporfly 4%. Reebok calls their proprietary mix of pebax “Floatride Foam”. A full layer of the nearly weightless Floatride foam is under the EVA rim. This gives the Floatride Run Fast enough cushion for an efficient runner to consider this shoe for marathon running. The combo of the two foams delivers a snappy well-cushioned ride built for faster paces. Add in the full rippled rubber outsole, and you have grip that even Spider-man will envy. 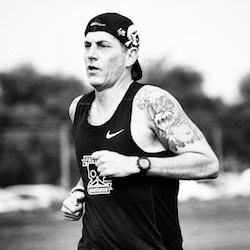 The traction is terrific on pavement, wood decking, and bricks that I encounter on my daily runs around Baltimore, but it was extremely noticeable at the track. Wearing the Reeboks during a 400 m repeat session was a treat. The sensation of feeling the outsole and the rubber track working together helped me finish the workout with a decent kick at the finish. ¡Mucho apretón! The Floatride fit true to size and has a 10mm drop. 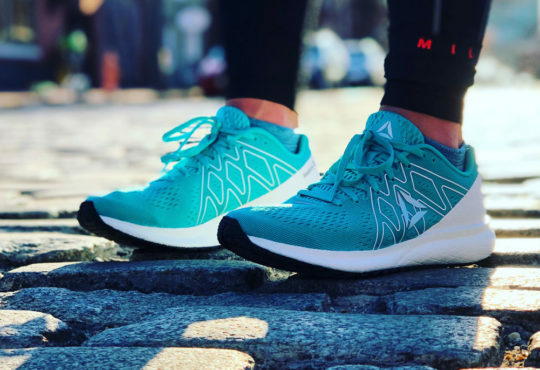 Meaghan: I’m always a little anxious to test out “fast” shoes. 1) They’re usually minimal in nature and I enjoy some cushion 2) I don’t want to be that jack wagon running slow in fancy, fast shoes. So I hit the track for my first run in the Float Ride Run Fast. They surpassed my expectations. The upper is designed with a thin, breathable engineered mesh and is comfortably snug. 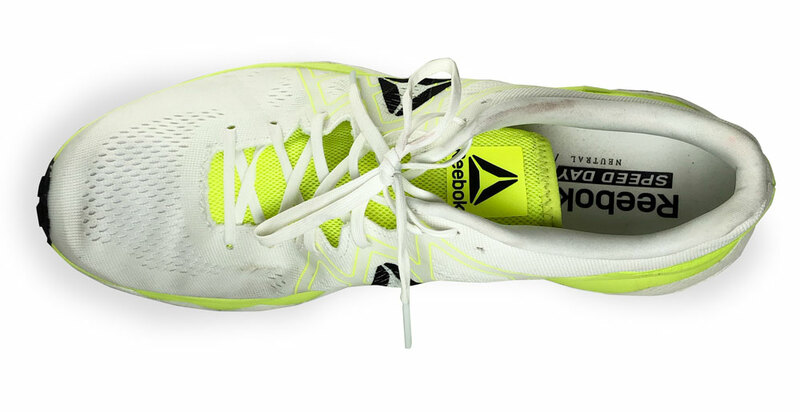 The midsole is made with Reebok’s FloatRide foam which contains a thermoplastic called Pebax. This is the same stuff that’s in the Vaporfly 4% – it gives the shoes that soft cushioning, but also an exceptionally springy feel. For such a lightweight shoe, there’s a load of rubber underfoot. The entire sole is covered in carbon rubber nubs that delivers an insane amount of traction, especially on the track. These shoes remind me of a softer Streak 6. I would definitely consider this for race day up to the marathon. The best feature? My W7.5 weight a mere 5.6 oz. Thomas: The bad has more to do with my form when I get tired. 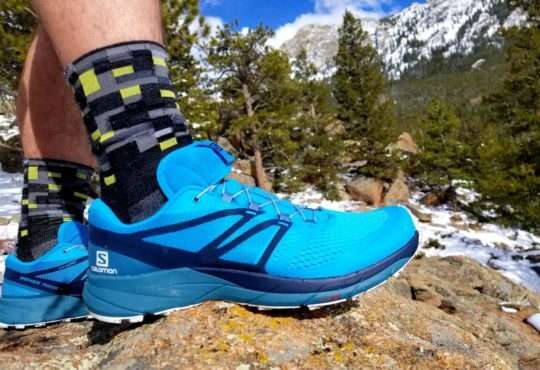 The rubber on the outsole does its job when it comes to traction, but when my legs got tired on a 15-mile run, it felt like the sticky rubber was highlighting my foot drag. I had to concentrate on my stride to keep my feet light. Otherwise, it felt like the breaks were being engaged, and it increased my overall effort. Meaghan: I had a similar experience to Thomas with the outsole. 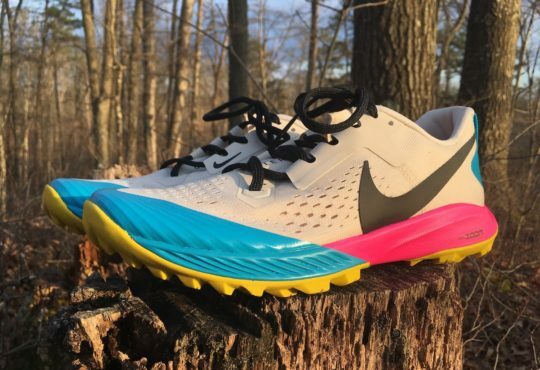 I took this shoe out for a 14 miler with some fast paces in the middle – the shoes felt great, but the rubber seemed to be working against me during the late miles. Tired legs and poor form turn the outsole traction into breaks. 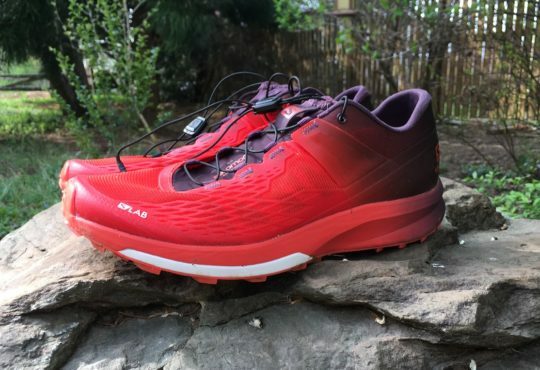 Thomas: The Floatride Run Fast is a superb fast day shoe. 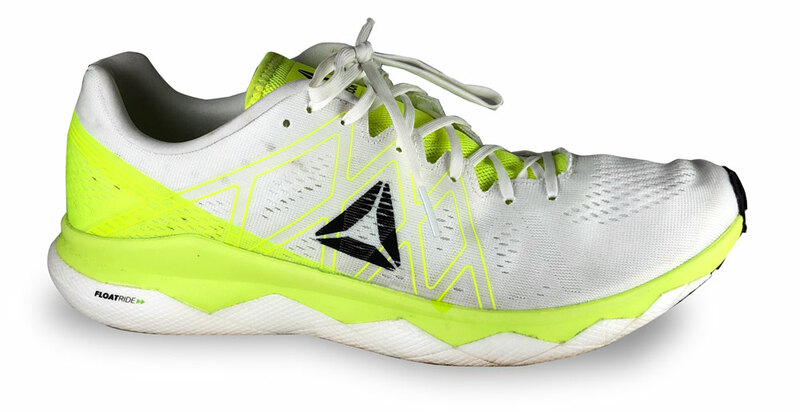 It checks all the boxes, light, responsive, well cushioned, with a fast feel. I would put this shoe in the same category as the Nike Streak 6 and the adidas adizero adios. While it has enough cushion for the Marathon, I would use it for up to a 13.1. The Floatride can handle the full, but with my form in the second half of a marathon, the cushioning might not be enough under the forefoot for my needs. After the 15-mile run in the Floatride Run Fast, my feet were feeling the miles. A lighter more efficient runner may find the Floatride Run Fast a perfect alternative to the Vaporfly 4% and at $140 they could almost buy two pairs of Floatride Run Fast vs. one pair of the Vaporfly. If you are on the track frequently, this shoe is a must have. Meaghan: I am a big fan of the Floatride Run Fast. I typically lean towards a firmer ride for race day and speed work, but the Floatride foam does well at fast paces. It feels bouncy and responsive at the same time and the sticky rubber gives you extra confidence on the track and road. If you’re looking for a lightweight, cushioned, bouncy shoe, the Floatride Run Fast is a great option. Thanks for checking out the review Harold. I do like the white and somewhat embrace the dirt that comes along with it. These would be stunners in blue though. These have definitely been on my short list for a fast day shoe (I’ve got the other end of the spectrum covered with a pair of Glycerin 15s right now). How would you compare this to some of the others out there like the Nikes you’ve reviewed (Zoom Elite 9, Zoom Streak 6, Zoom Speed Rival 6)? I can pick those Nikes up for about half the cost right now. 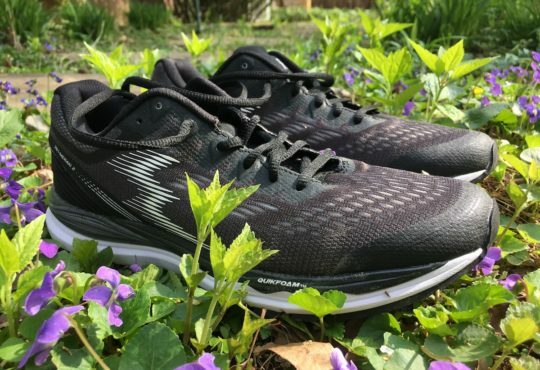 Heck, the Sketchers Performance GOmeb Speed 5 is $50 at RW right now. Are the Reeboks worth the extra $$$? The Zoom Elite 9 is softer under foot and I like the responsive feeling of the front air unit, Streak 6 has less cushioning in the heel than the Run Fast but has a similar feel, Nike Rival is one of the best budget shoes out there, but the Run Fast is a little more substantial and can take you further. I wasn’t a huge fan of the last GOmeb Speed. Hi. How do they fit?. They look wide… are they?.